Whether we are protecting military codes, patent applications, health records, the integrity of ballot counts, credit card numbers, or what we browse online – how can we enjoy all the benefits of cyber life but avoid the many seen and unseen pitfalls? There is a lot of reading this week but most of it is easy and all of it is important. It’s worth looking at some of this from a “landscape” perspective. Look at this (you;ll need a big screen, not your phone), beginning on the right – what are the big categories of targets? 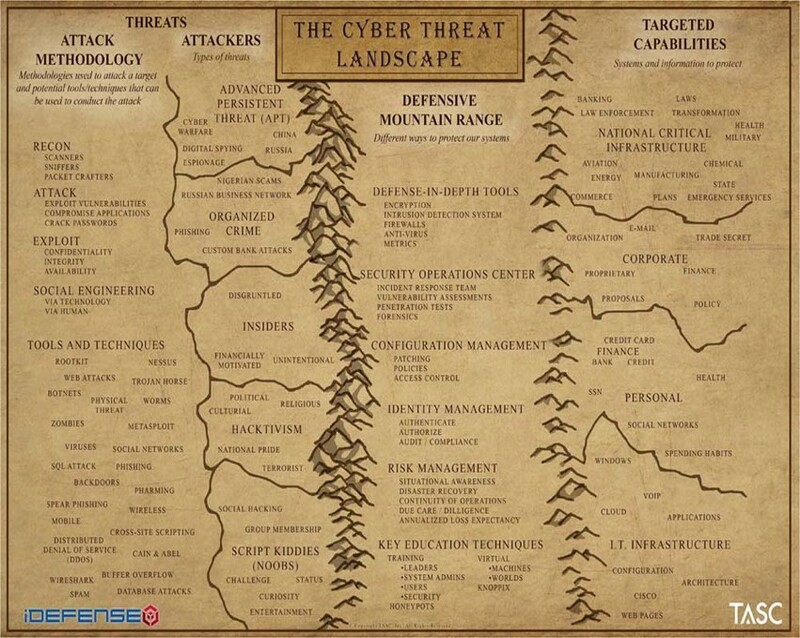 And then on the left, what are the threats? You probably know this name. Just in case, it’s worth considering the stories that came out about US Government surveillance and cooperation with US tech firms. We start with the two articles from the Washington Post that got this all underway in 2013 – the Guardian was doing this at the same time. Barton Gellman and Laura Poitras id PRISM and other NSA cooperation with all the big tech companies – Facebook, Google,Microsoft, and more. Start with the graphics: the NSA slides that the Washington Post published (also here: snowden – wapo – slides ), Next, read the story and watch the interview (6:09) of Gellman at the top of the story. Two days later we learn about the mysterious source, Edward Snowden: read the storyand watch the Guardian’s interview (12:34) of him. How vulnerable are American elections to anonymous outside influence? This can mean different things. It can mean tampering with voter rolls, or the counting process, or the reporting of the count. These are not what we’ve been talking about with Russia and the 2016 elections. If Putin says, Vote for Trump, that’s one thing. If a Russian government agency – or teenagers in Macedonia – post ads on facebook pretending to be almost anyone else, how much should the US worry?